Our mission is to make authoritative information about the skin accessible to anyone in the world with an internet connection. DermNet NZ has become a world renowned resource all about the skin. The website is owned by the DermNet New Zealand Trust. It has been HON (Health-on-The-Net) certified since 1996 and is in continuous development to provide information about the skin over any desktop or mobile web browser. Dr Amanda Oakley, DermNet's founder, was most recently honoured by being appointed by Her Majesty The Queen as a Companion of the New Zealand Order of Merit in recognition of her services and contribution to Dermatology. She was also awarded the Google Technology Service in the Charitable Sector's Lifetime Service Award at the New Zealand Charities Technology Awards in March 2017 and was a finalist in two categories the New Zealand Woman of Influence awards in June, 2017. Amanda and Emily Oakley, DermNet's Development Manager, were named a top SheEOs at the SheEO World Summit in Auckland, April 2018. 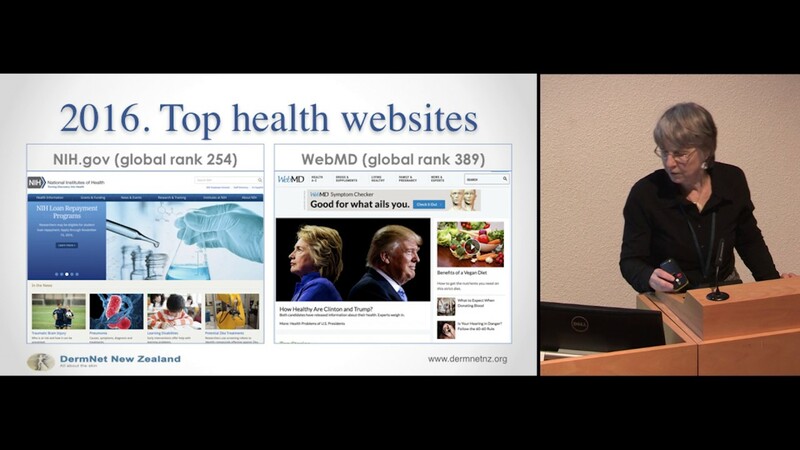 Since its launch in 1996 DermNet has been at the forefront of Internet Dermatology. Do you love DermNet NZ? Please consider making a donation. Supported by the New Zealand Dermatological Society, DermNet New Zealand was launched over 20 years ago by Dr Amanda Oakley and a small team of New Zealand dermatologists. In a world where Wikipedia and Google hadn’t yet been invented, the doctors pooled their resources to provide a completely free and trustworthy online dermatological library certified by Health on the Net. In 1996, a summer student was employed to upload information sheets written for patients by DermNet's inaugural Chairperson, Dr Mark Duffill, and to scan hundreds of transparency slides. Over time, it became clear that DermNet NZ should also focus on health professionals, researchers and students looking for up-to-date summaries about skin conditions and treatments. 20 years later, DermNet New Zealand is a Charitable Trust led by a Board of Trustees. Its website is the world's most popular dermatology resource, loved by dermatologists, primary care physicians, students and patients. Every day, the website hosts up to 80,000 visitors asking, What’s this rash? and How do I treat it? Google provides translations in over a hundred languages. Our thousands of clinical images appear worldwide in presentations, journal articles, posters, smartphone apps, websites and blogs. DermNet NZ has more than 2,300 topic pages and 25,000 clinical and dermatopathology images. More than 100 new topics and 500 clinical images are added every year. All pages are written and reviewed by dermatologists, other health professionals, medical writers and students. Many writers are based in New Zealand, but others have contributed from UK, USA, Canada, Australia, Mexico, Indonesia, Sri Lanka and elsewhere. In mid-2016 the website was completely redeveloped by Room9 to provide a mobile responsive, content-management driven, optimised platform, using SilverStripe. This makes the editorial team's work easier, with a responsive system to please our mobile readers (and Google's algorithms). Technical development of DermNet NZ is now supported by Toast. Social media has been enhanced on Twitter and Facebook, with the help of New Zealand dermatologist, Dr Victoria Scott-Lang. Today DermNet NZ has a staff of 6, and regular contributors to content. The website is heavily reliant on volunteers to write up-to-date pages; and on corporate supporters to fund website hosting, development, writers, and editors. Volunteers and sponsors help to keep DermNet free and accessible by anyone with an internet connection. Do you want to help? Dr Amanda Oakley presents The History Of DermNet NZ at The International Society Of Teledermatology. In this presentation, Dr Amanda Oakley talks about her incredible journey with DermNet NZ and how it started at a time before Google and Youtube existed – when computers were huge and the connection was dial-up. Produced by the International Society of Teledermatology at the World Congress of Teledermatology, 15 October 2016. Reproduced by DermNet New Zealand, with permission. Dr Steven Lamb is a Dermatologist at the Auckland District Health Board as well as private practice. More about Dr Steven Lamb. Dr Anthony Yung (1968-2018) was the Chairperson of DermNet NZ at the time of his untimely death on August 3rd, 2018. He was a consultant for the Waikato Hospital in private practice in Hamilton, New Zealand. He was also a member of the New Zealand Dermatological Society. More about Dr Yung. Dr Steve Helander is a is a specialist dermatologist and dermatologic surgeon at the Auckland District Health Board as well as private practice. He graduated in Auckland and also trained in London and at the Mayo Clinic in the USA. More about Dr Steve Helander. Dr Victoria Scott Lang is the Treasurer of the DermNet Trust Board and the Social Media lead for DermNet. Victoria is a Consultant Dermatologist at KM Surgical, a private practice and state-of-the art dermatology clinic in Christchurch. Victoria is also on the executive committee of the New Zealand Dermatological Society. More about Dr Scott-Lang. An online image shop, to streamline purchases of thousands of unwatermarked clinical images at various resolutions. Sadly, developing the site costs money. You may see from time-to-time donation drives—please give generously—and we'll be expanding our advertising portfolio. For in-depth information about individual skin diseases, refer to Medscape Reference Dermatology Articles or one of the major conventional published references. DermNet NZ is funded by donations, advertising, commercial sponsorship and image licensing. For more about our partners and commercial sponsors and advertisers, visit our sponsors’ page. Or consider becoming a sponsor. Contact us if you would like to donate images. Test for elevated inflammation markers (C-reactive protein, erythrocyte sedimentation rate), test for paraproteinemia in adults, look for signs of neutrophil-rich infiltrates in skin biopsy; perform gene mutation analysis for hereditary periodic fever syndromes (eg, cryopyrin-associated periodic syndrome), if strongly suspected. Patients should be asked, “How long does each weal last”? Test for Complement C4, C1-inhibitor levels and function; also test for C1q and C1-inhibitor antibodies, if acquired angioedema is suspected; do gene mutation analysis, if former tests are unremarkable, but patient’s history suggests hereditary angioedema. If there is no remission after six months of ACE-inhibitor discontinuation, test for C1-inhibitor. Does the biopsy of lesional skin show damage of the small vessels in the papillary and reticular dermis and fibrinoid deposits in perivascular and interstitial locations suggestive of urticarial vasculitis? Patients should be asked “Can you make your weals appear? Can you bring out your weals”? In patients with a history suggestive of inducible urticaria standardised provocation testing according to international consensus recommendations (Magerl 2016) should be performed. Acquired autoinflammatory syndromes include Schnitzler syndrome as well as systemic-onset juvenile idiopathic arthritis (sJIA) and adult-onset Stills disease (AOSD); hereditary autoinflammatory syndromes include cryopyrin-associated periodic syndrome (CAPS) such as familial cold auto-inflammatory syndromes (FCAS), Muckle-Wells syndrome (MWS) and neonatal-onset multisystem inflammatory disease (NOMID), more rarely hyper-IgD syndrome (HIDS) and tumour necrosis factor receptor alpha-associated periodic syndrome (TRAPS). In some rare cases, recurrent angioedema is neither mast cell mediator-mediated nor bradykinin-mediated, and the underlying pathomechanisms remain unknown. These rare cases are referred to as 'idiopathic angioedema' by some authors. Dermatologists needed. Find a Job.